As a graduate student in public health, I spent my days talking about illness and death. Normal lunchtime conversations among students covered topics like: how to define a case of multiple sclerosis, the most effective strategy to stop HIV transmission among injection drug users, and the probability you’d be alive in five years after a breast cancer diagnosis. None of this talk about illness remotely prepared me for the experience of illness. I was blissfully naive when I started dating a man named Evan with a cough that wouldn’t go away. Over the course of a year, Evan got progressively worse in a series of fits and starts. He was in and out of the hospital and died toward the end of 2012. I was heartbroken and devastated. But within a few years, I healed and was back to participating in normal life. Then, I started getting dizzy spells and severe face pain. A few months later, a very large yet benign tumor was removed from one of my sinuses. I spent months confined to my apartment waiting for my sinuses to heal and the pain to subside. Through these experiences, I’ve seen how a lot of our well-intentioned responses to illness don’t have the intended impact. Here are the top eight lessons I’ve learned a lot about how to be a terrific support as a family member or friend. 1. Do what is needed, not what you think you should do. At the lowest points in Evan’s illness, I had a hard time eating. I barely slept. I was always bracing for what would happen next. Evan spent twenty-one nights in the hospital over the course of eleven months. I didn’t spend any. Not because I didn’t want to. Because he asked me to leave. Because he wanted me to get enough rest so that he could count on me coming back. So that I’d be safe to drive and bring him outside food. So that he could trust me to research the doctor’s recommendations and help him communicate his choices. Because he could tell how scared I was, and my fear was making him feel anxious. Many of us have dreams of being the valiant caregiver who selflessly never leaves the hospital bedside for a moment. If that’s how you think it will go down, I want to tell you something: that may not be what your loved one needs from you. Leaving their side can feel awful. You may feel crushing guilt from not being able to do enough. Friends or family may question your commitment. And when things are really bad, there’s the gnawing fear that you’ll miss out on the moments when you were truly needed. But if going home to sleep, taking a walk, or spending an hour crying on your friend’s shoulder is going to make the difference between you being a guilt-laden, anxious wreck and your best self, that is what your loved one needs from you. Serious illness is a marathon. Don’t mistake it for a sprint. 2. If your loved one wants to talk to you about death, listen. For most of the time that Evan was ill, we thought that he had a lung disease that was treatable. It was only in the last two weeks of his life, the day after they sedated him and put him on a ventilator, that we found out that he was terminal. A rare form of lung cancer. A month before his death, when he was still at home, Evan had talked to me about what he wanted me to do if he didn’t make it. I cut him off after one sentence. Of course I would do what he asked, but I told him that this wasn’t something we needed to talk about. He was going to get healthy! This conversation is my biggest regret. Evan didn’t think I deserved a boyfriend who was sick. He tried to break up with me twice so I could go find a “normal” boyfriend. I wasn’t having it. On that night, I wish I had acknowledged how scary things were for him. I wish I had let him know that whatever happened, I had no regrets about the time we spent together. Because I never got another chance. Don’t miss an opportunity to hear what your loved one wishes for you, because you think you’ll be able to do it later. Later, may never come. 3. Every so often, check in on the support person. Derek and I agreed that one difficulty was how friends and family were so focused on how the patients were progressing that us caregivers often felt invisible and unappreciated. Everyone wanted to know how the patient was doing, what treatment we were trying, and if it was working. But few asked me and Derek how we were doing. It’s natural for people to be curious about what’s happening with the illness and the patient. But illness impacts all the people close to the patient, too. Caretakers shift our work schedules so we can be there at the important doctor appointments. We file the bureaucratic hospital paperwork. We learn the ins and outs of insurance companies. Being a support person is stressful and scary, yet caregivers often feel conflicted about asking for help themselves. They don’t want to draw attention or resources away from the patient. As a friend, regularly checking in on what you can do to help the support person can help them be a more reliable support. 4. Don’t hide the fact that you’re unhappy for months. When your loved one is sick, you may decide that you want to put off a difficult conversation with them. I know, because I’ve been both the support person who has put off the conversation and the sick person who wasn’t told something. When I was sick, I wasn’t able to be the kind of friend that I was when I was healthy. I was grumpy. I wasn’t as quick to pick up on nonverbal cues. My thinking was muddled and foggy. During this time, I had a close friend who got tired of sick Lori. When I reached out to her, she would delay our get together, chalking things up to a busy work schedule. Eventually she would agree to meet up and then not enjoy the time we spent together. Months later, when I was feeling better I asked her if something was wrong. To her credit, she fessed up that she hadn’t been feeling satisfied by our friendship for months. She hadn’t said anything because she was worried I wouldn’t be able to take it. We are no longer friends. 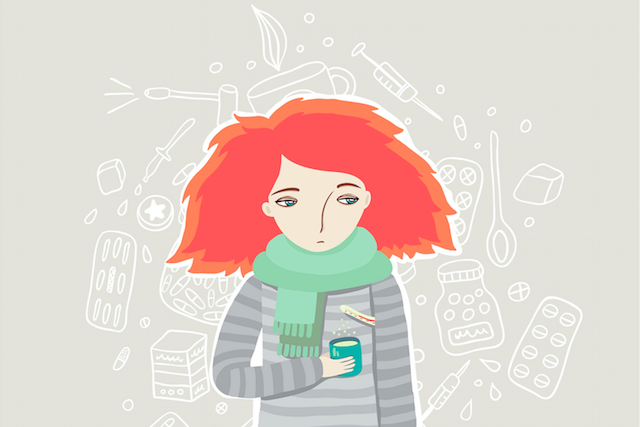 If you’re feeling unhappy about a relationship with a person who is sick, don’t bottle it up and hope it will go away. If you’re just showing up out of a sense of duty, you won’t have much staying power. And that day when you disappear with no chance of returning is more than a disappointment for your sick loved one. It’s a crisis. 5. Understand that “cheering up” a sick person may backfire. The surgeon who took it out my tumor warned me that it would be months before I was pain-free and back to normal life. I shared this information with my family. Nevertheless, about two weeks after the surgery my mom started asking me if I was pain-free every time she texted me. Three weeks after surgery, she sent me pictures of her trip to Disneyworld with the rest of my family. We’re at the Magic Kingdom!!! There’s a new Under the Sea ride!!! Hopefully, you are out of pain by now!!! I’m sure that my mom’s intention was to try and cheer me up. To remind me that there were fun things to look forward to in life. Instead, those texts and photos broke my heart. They showed me that my mom was not ready to accept the seriousness of my situation. I was at the beginning of six weeks of excruciating pain and no effective medication to counter it. I spent a few hours each day screaming into a pillow and questioning whether life was worth this much pain. After those texts, I stopped asking my mom for emotional support, because I no longer believed she could give it. If your loved one is really sick, be sensitive. Acknowledge how tough things are before you gush about your magical vacation, your budding romance, or the wild dance party you went to last night. And if your loved one tells you they’re not in the mood for happy stories right now, honor their wishes. 6. Realize that your chicken soup may not be wanted or helpful. Healing often means special diets. After my surgery I was on a paleo diet with a Chinese medicine twist. Every few weeks the Chinese medicine recommendations would shift as my body’s needs shifted. It was exhausting to keep track of what I was supposed to eat and what I wasn’t. But I couldn’t deny that the diet was helping. I was feeling better. So every time someone offered to make food for me I felt anxious. My dietary rules were complex and varying, and for a while I was in so much pain that I was communicating with a whiteboard, which made it hard to communicate the myriad ways you could mess up. There is nothing worse than receiving food that a kind person has made for you that you can’t eat. Even though you tried to tell them how they had to read the ingredients list on everything. Even rotisserie chicken. Because that “seasoning” contains gluten that you’re not supposed to eat. If you do make food for someone on a restricted diet, know that you are not just making food. You are making medicine. And your care and attention to detail needs to be the same as if you were preparing to give someone medicine. 7. Be prepared for plans to change. Every year, my friend Charlotte invites a group of us out to dinner for her birthday. When she invited me in 2015, I told her it would be a long shot for me to go, but I wanted to try. Her birthday came two months after my surgery. I was in bad shape. I was having pain episodes that had me crying into a pillow a few times a day. I was also on a restricted diet and trying to limit my physical activity so I wouldn’t spark new pain episodes. Charlotte is one of my closest friends, and she did everything she could to make it work. She chose a restaurant that had food I could eat. She called ahead and asked about stairs and elevators. She figured out which of the options had the shortest possible distance between where she could drop me off and the front door. And I still couldn’t go. The pain was too bad and I was too tired. I didn’t want her birthday to be spent watching someone cry in pain at her table. Thankfully, Charlotte was understanding. If your loved one is sick, the fact that they need to change plans in no way reflects how much they care about you. They are not in control of what happens. Trust that they are doing their best. Don’t take it personally. 8. Take all of these guidelines with a grain of salt. The one certain rule is that there are no certain rules. Depending on the circumstances and the people involved, all of these things could change. Some people may want you to distract them from the circumstances or the pain by pretending that everything is like it used to be. Or they may appreciate you holding your tongue. If you aren’t sure that what you are doing is feeling good to the sick person, ask them. Let them know that it’s okay to tell you the truth. You want to care for them and if there’s anything that you can do differently to take better care of them, you want to know what it is. Have you been ill? What did you find most supportive? Least supportive? Have you been a caregiver? What are you most proud of? What do you wish you had done differently? Lori Puma works with coaches who have made tough changes to create a better life for themselves. She helps them share their story so that they get recognized as experts and make more money. If you want an honest, behind-the-scenes look at what it takes to turn a passion into an online business, check out The First $20k.